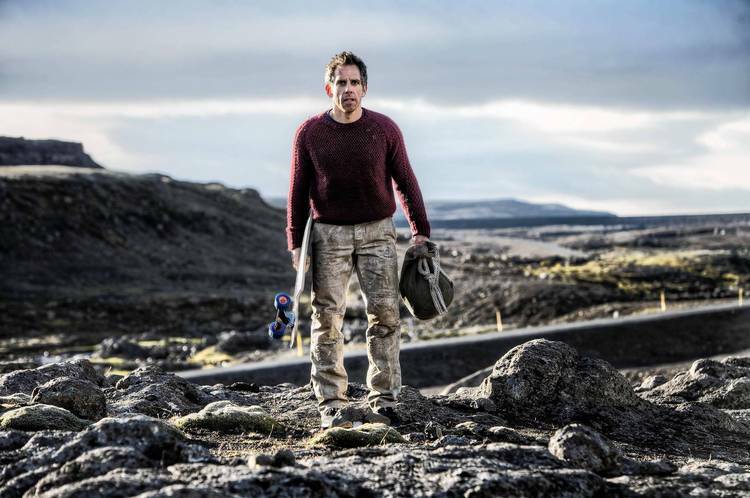 There were several "big" projects previewed at the 2013 CinemaCon in Las Vegas, but the one that (surprisingly) generated the most enthusiastic buzz was the 15-20 minute presentation for director/actor Ben Stiller's The Secret Life of Walter Mitty, which opens in theaters this year on Christmas Day. Furthermore, the positive reception for the Walter Mitty footage coincides with the reports about Robert Downey Jr. indicating he wants Ben Stiller to direct the new live-action cinematic take on Pinocchio that RDJ has pitched and intends to co-headline - by playing the puppet-maker Geppetto, rather than the titular wooden boy (lest you think the actor is pulling a Roberto Benigni). Secret Life of Walter Mitty, for those not familiar, is a remake of the 1947 movie, which was loosely based on James Thurber's short story. It details the experiences of the eponymous Mr. Mitty, who handles the unpleasantness of reality by leading an active fantasy life; that is, until the two merge, and Walter finds himself on an adventure as grand (and dangerous) as those in his daydreams. The remake's script was written by Steve Conrad (The Pursuit of Happyness) and spent many years bouncing around Hollywood - with various directors and comedic actors boarding/dropping the project - before Stiller agreed to star in and direct the film himself, back in 2011. The film feels like a mixture of the loneliness of [Eternal Sunshine of the Spotless Mind], the hopeful comedy of (500) Days of Summer, and the epic bigger-than-life moments of Forrest Gump. The always-lovable Kristen Wiig co-stars as a woman Walter has a crush on. He fantasizes about her in various moments of his life. These fantastical daydream sequences are what bring this film to a completely different level than the character-based comedies we’ve seen in the past. ... Walter Mitty feels like it could be a really special film, one that doesn’t come along every year. Heartfelt, funny, but with fantastical moments that are meant to be seen on the big screen in an audience full of strangers. It's worth noting that a similar film, Life of Pi, earned an equally-positive response from CinemaCon attendees last year, and then went on to become a hit at the box office and 2013 Academy Awards ceremony to boot. Naturally, the question on (most) everyone's mind right now is: Will history repeat itself? NEXT PAGE: Robert Downey Jr. wants Ben Stiller to direct Pinocchio?